Marietta Silos leads the nation as the only contractor in the United States that does silo engineering, design, construction and repair. We have pioneered cutting-edge practices and materials for over a century and bring our expertise to industry professionals across the country. Marietta Silos is the largest silo repair company in the United States and the only one involved in Jumpform, Slipform, and concrete stave and silo construction for industries such as manufacturing, mining, chemical, and power. Therefore, we are the only firm in the country that can take care of every aspect of your silo, from design to construction. We offer concrete silo construction to accommodate a variety of storage materials. Our designs take material, flow patterns, size, and more into account to provide customers with the highest quality silos on the market. Both Slipform and Jumpform techniques are utilized so silo size is never an obstacle. 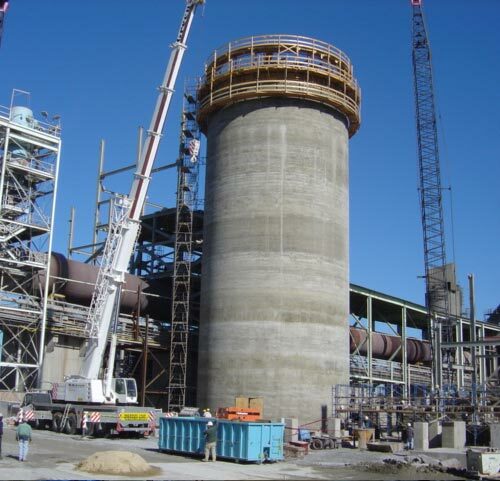 In addition to design and construction, Marietta Silos provides numerous repair and maintenance services for all silos, whether Jumpform or Slipform, concrete stave or steel silos. We solve minor and emergency silo issues quickly and thoroughly. Our high-level safety standards ensure your silo is sound during and after the construction or repair process. Choose Marietta Silos. Choose the highest quality silo construction and repair.